Savory Cheddar Muffins with Basil and Scallions, perfect served alongside a big holiday meal or for brunching it up with family and friends. Have you jumped on the savory muffin bandwagon yet? These bad boys are where it’s AT! 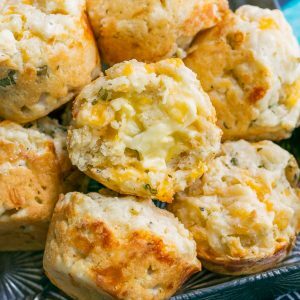 They have this wonderful flavor explosion going on for them thanks to the combination of sharp cheddar, garlic, green onion, and basil, making them pretty darn addictive! At one point I had to cut Paul off so I could save a few for the brunch date I had planned with some friends the next morning. He pouted like the man-child that he is but kept his promise to save the rest. I’m planning on making another batch for Easter weekend that he can faceplant into these fluffy muffins without sharing. Well… he still has to share with me. And the chickpea. But we couldn’t possibly eat that many right? Poor guy; we could easily eat our weight in muffins! These fantastically fluffy muffins channel the flavor and texture of my favorite drop biscuits in muffin form! They’re best hot and fresh from the oven and also taste amazing warmed up with a bowl of piping hot tomato soup. Set oven rack to middle position and pre-heat oven to 375 degrees F. Grease a 12-cup muffin tin with butter or oil and set aside. Whisk together flour, baking powder, garlic powder, salt, basil, and pepper in a large mixing bowl. Stir in cheddar and scallions and mix well until fully coated. In a separate bowl, whisk together milk, sour cream, cooled melted butter, and egg until smooth and creamy. Make a well in the middle of the flour mixture and pour wet ingredients into the center. Gently fold until just combined and very sticky. Batter will be thick almost like you're making drop biscuits. Use a pair of large spoons to evenly divide batter among muffin cups and sprinkle each muffin with parmesan cheese. Bake for 16-18 minutes rotating the muffin tray after the 8 minute mark for even browning. When you rotate, feel free to brush muffin tops with melted butter for an extra golden top. Bake until a toothpick comes out clean from the center and muffins are golden brown. Allow to cool in the tray for 5 minutes, then transfer to a wire rack to continue cooling. They're pretty darn amazing hot from the oven so if you're anything like us, you'll be stealing muffins off that cooling rack and faceplanting into them in record time! These muffins are best the first day but still very tasty for the next 2-3 days! Store leftovers tightly wrapped in the fridge and warm them up by baking in the oven or toaster oven at 350 degrees F until hot and fluffy. Oven times will vary and mine were hot and ready in about 15 minutes! For extra golden muffins, feel free to melt a wee bit more butter to brush on the tops of your muffins when you rotate them halfway through baking. It's GLORIOUS! Recipe adapted from The American Test Kitchen’s Family Cookbook <— one of my favorite cookbooks for baking inspiration! The house will smell so flipping good once these bad boys are ready that your crew won’t be able to keep their hands off them for long! currently crushing on: my snazzy new hair dryer – this thing is a lifesaver! 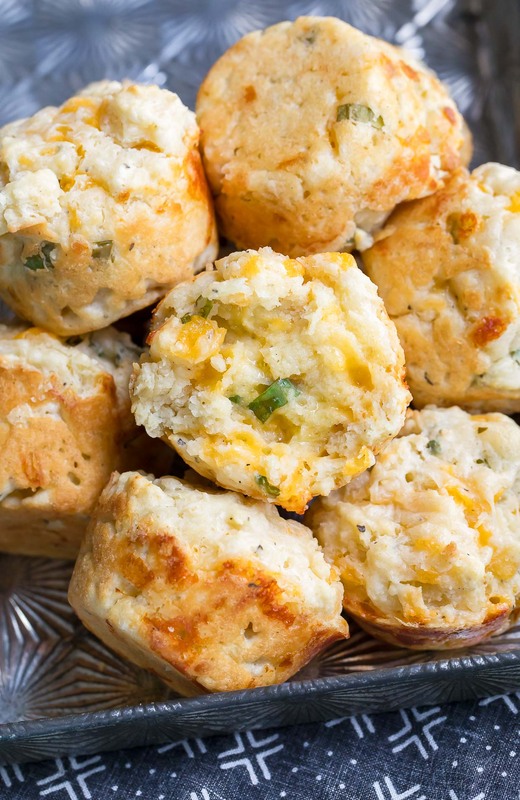 If you get a chance to try these savory cheddar muffins, let me know! You can leave me a comment here (LOVE checking those daily!) or tag @PEASandCRAYONS on Instagram so I can happy dance over your creations. I can’t wait to see what you whip up! How would you bake these differently if using the mini muffin tins? Hey Jan! To prevent over-browning I would reduce the bake temperature to 350 F and then check them at the 10 minute mark. For mini muffins it should take approx. 10-13 minutes and you can test them with a toothpick (or swipe one to taste test) after 10 minutes to help gauge the exact cook time you’ll need. Hope this helps and LMK how it goes! Love these flavors! So much yum! These are a perfect accompaniment to almost any meal! 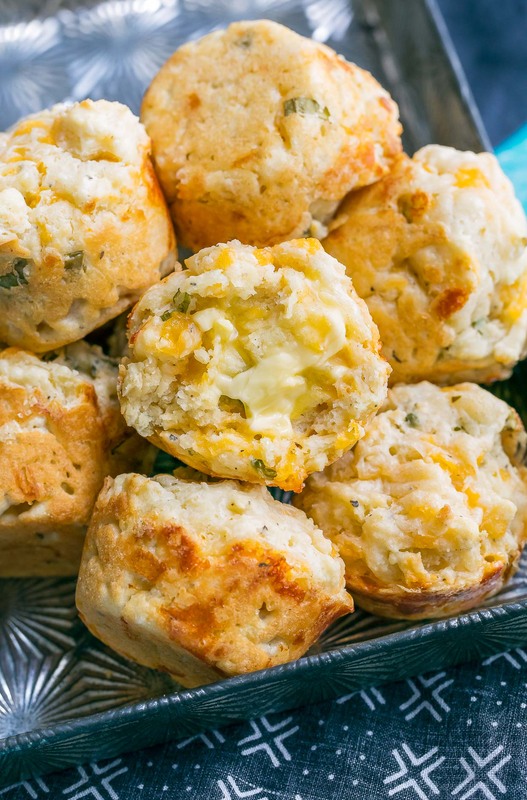 Love these delightfully cheesy muffins with a hint of basil! These look super tasty. I love savoury muffins – and anything cheesy as well!